Without a specific plan, every path Michael Bostwick (BS ‘75/MA ’82) chose in his educational journey ended up being the right one at the right time. And as he looks back over his career, Bostwick feels he’s been very lucky. But Bostwick’s luck translates into great fortune for all the students he has influenced over the years, especially those as executive director and principal of Katoh Gakuen Gyoshu, Japan’s first K-12 English immersion school. Bostwick’s professional experience began as an elementary teacher and wrestling coach in Iowa City’s public schools where he worked with students from kindergarten through college. But a foreign direction intrigued the former Hawkeye wrestler and Iowa City native. “I wanted to live abroad for a year or two to broaden my world perspective, experience life in a culture as different from my own as possible, and perhaps learn something about myself and my country by looking from the outside in,” he said. So, with a fascination in Zen Buddhism and the Japanese culture, and a Japanese Ministry of Education Fellowship, Bostwick embarked upon a new life path and fell in love with the country. As fortune would have it, Tokai University—one of the largest private universities in Japan—hired Bostwick to teach English and English Education. His research focused on content-based foreign language instruction. Instead of teaching a foreign language by using dialogs and grammar instruction, he taught content—using a course from the school curriculum such as psychology—with the foreign language as the medium of instruction, which proved to be a most effective way of acquiring a foreign language. Because of his work in English as a foreign language, his growing proficiency in Japanese, his prior experience teaching K-12 Japanese students, and his early foundations in teaching elementary school established in Iowa, Dr. Katoh asked Bostwick to start a bilingual school. “I have the advantage of looking back and seeing that all of my various professional experiences became calculated steps preparing me for what I do now,” he said. Bostwick’s role has evolved over the years as the school has grown. Starting with just 28 students, the private school now enrolls over 570 students, turning away nearly half of all applicants. In the early years he was a “teaching principal”—teaching classes, creating curriculum, recruiting students and administrating the program. Now, his primary job is recruiting, hiring, and training staff, which includes about 35 foreign staff and an equal number of Japanese staff. One of the exchange programs brings students to the Iowa City/Cedar Rapids area each year. In perfect English, without a hint of an accent, tenth grader Mikako Tai raved about Bostwick, her teacher and principal, during a recent visit. Darryl Mann, Katoh junior high math teacher, said he admires Bostwick’s leadership. Colleen Butler, Katoh’s elementary immersion director, agrees saying Bostwick is an inspirational administrator with amazing energy who is always on top of the latest developments in English immersion education. The immersion school is having an impact on education throughout Japan. 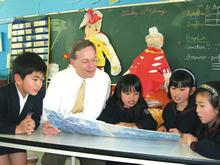 In 2000, Bostwick and the immersion school received a special award from the Japanese Association of College English Teachers—only the second award given in its 50-year history—for the “amazing educational achievement and the significant impact” the revolutionary program will have on English education from elementary school to university in Japan. McGill University Professor Fred Genesee, one of the world’s leading authorities on immersion education, often cites the immersion program Bostwick created as a model of the highest quality. Last year the school’s first class graduated from the program. Of the 17 students who graduated, nine enrolled in U.S. colleges, including Harvard, Yale, and Duke universities, and eight went on to Japanese universities. “Ultimately, we hope that they become ‘global citizens’ while maintaining their Japanese identity and a deeper understanding of their own language and cultural heritage,” Bostwick said. Even though Bostwick’s duties at the school keep his days and evenings full, he still finds time to translate for international events, such as the Special Olympics World Winter Games, on a volunteer basis. University of Iowa education connections run wide in Michael Bostwick’s family. His father, Robert Ray Bostwick (BSC ’51/MA ’56), went on to get his Ed.S. and retired as superintendent of College Community Schools in Cedar Rapids, Iowa. His sister, Kerry Ann Bostwick (BGS ’88), went on to get her Ph.D. in education and teaches in the Teacher Education program at Cornell College in Mt. Vernon, Iowa. Michael Bostwick received his Ed.D. in Applied Linguistics from Temple University, Japan, in 1999.